Here you will find an interesting selection of military helicopters and civil airliners from world famous brands such as Boeing, Fokker, and Westland. 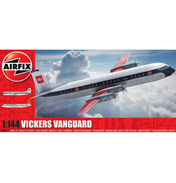 Most well known Airfix planes are available, however alas one of the most famous in the Concorde is no longer available following its sad demise and retirement flight in 2003. American Boeing is probably the most famous, and largest of all civil aircraft manufacturers. It actually started back in 1916 by a Mr W Boeing and has grown enormously since the early days, merging with another manufacturer McDonnell Douglas in the 90’s. It started out in seaplanes, with the US Navy ordering some of the early models for the First World War. After this war ended Boeing for a time had to diversify whilst the market recovered. It next started to develop fighter planes and in this area became very successful. Subsequently involvement came through the introduction of mail planes in the mid to late 1920’s. This led to its first passenger flight in 1929 on the Boeing 80. In the next couple of decades design and technology advancements led to the creation of transoceanic passenger airplanes and planes capable of withstanding higher altitude travel. World War II saw their involvement again in the supply of bombers and it was this military interest that kept them afloat after the war had ended. Indeed during the 50’s and Cold War era they even helped build a missile. This time also saw them develop the first jet engine, which was first commercialised in the 707 model. 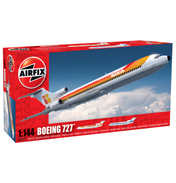 The 1960’s saw the manufacture of the Boeing 727 a commercial jetliner which you can find here as one of Airfix’s 1:144 scaled planes at skill level 2. This plane is featured as it was one of the very first successful commercial jet planes of its time. It then introduced the 737 model in 1967. This was a jet with twin engine capable of short to medium ranges of travel. 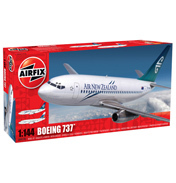 Airfix have this Boeing 737 available in model form as it has actually been the most successful, in terms of best selling, commercial jet aircraft in aviation history and is in fact still in production following constant redevelopment as a result of new technological developments. 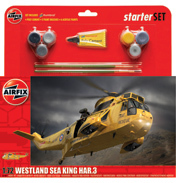 The current Airfix kit is available with 2 decal finishing options and at level 2 with 48 parts is easily doable. Later jets from Boeing include the 747 with four engines and built for long range, and the twin aisled 767. The 1990’s saw the 777 which became the longest range twin-engined airliner and also featured the fly by wire system for the first time. The 787 was also released for flight in 2009 however in current times Airbus has become a massive competitor and taken over from Boeing’s market leader position, probably due to the introduction of the 787 rival, the Airbus A350. Boeing continues also to develop their other commercial planes, including the 747-8 as well as military aircraft. Hopefully Airfix will feature some of these newer civil airplanes in their collection in the near future. Not everybody is aware that Boeing also manufactures helicopters (Boeing Rotorcraft Systems) in the Chinook and Apache Longbow both available here as Airfix Helicopter model kits. The AH-64 Apache has four blades and two engines and holds a crew of two in the cockpit. Its design dates back to 1975 and was selected for use by the US Army which remains the key user to this day with it serving in the Iraqi and Afghanistan recent conflicts. The British Army uses a modified version of the Apache Longbow the Apache AH1. 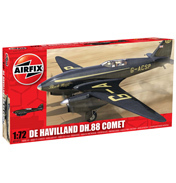 Airfix’s model is scaled at 1:72 with 89 parts and is also skill level two so not too advanced. The Boeing Chinook Airfix Kit gives a realistic model of this very distinctive helicopter. Its key distinguishing features being the twin rotor twin engines which make them capable of lifting heavy loads such as troops and load supply for battlefields. This is skill level two as well. 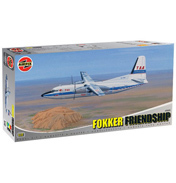 A Dutch airline manufacturer Fokker is also included by Airfix in the F-27 Friendship model in scale 1:72. The design dates back to the 1950’s and is known as a turboprop engine, where unlike a jet engine, a gas turbine is used to drive propellers on the engines. This type of engine gives better fuel efficiency, and can be used where short take offs and landings are required which makes them a popular commuter plane. It is used by Trans Australia Airlines hence the decals used on the Airfix Fokker model. It ceased production in 1987 however many are still in use today as freight planes. At level 2 with 70 parts this makes for an excellent small project. The Comet Racer is also available here for its role in the 1930’s England to Australia Air Race. 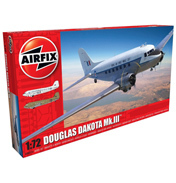 Specifically it is a De Havilland DH 88 and the Airfix kit is the easiest level number 1 as it only has 24 parts, so is fun, quick and easy to complete. 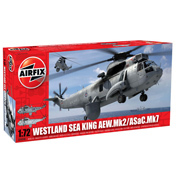 Finally Airfix have a few Westland Model Helicopters including the Navy’s Westland Lynx and Sea King which is used by the Navy, Marines and also RAF. All of the Airfix Civil Planes and Helicopter kits found on this shelf require painting, if so desired, and these paints can be purchased separately along with brushes and glues. If you want complete sets then look under Gift Sets. 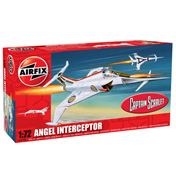 This range also includes Airfix's Sci-fi models, the Angel Interceptor and Stratos 4 TSR.2MS. One model is taken from the cult Japanese animated series, Stratos 4, and the reason why Airfix include this model is that many of the craft used in the show are based on actual aircraft from the 50's through to present day. For instance the Stratos 4 TSR is based on the TSR.2. The Angel Interceptor is from Sci-Fi TV show Captain Scarlet and these fighter jets are piloted by female pilots in the show due to their faster reflexes!